Wondrous is God in His saints, the God of Israel! Every Orthodox Christian knows that our Holy Bible ends with the sacred book which is called in Greek Apocalypsis, and is the Revelation of the Holy Apostle and Evangelist John the Theologian. In this book of Revelation the great prophet and seer of mysteries, the Apostle and Evangelist John the Theologian, in majestic visions, symbols, and images, as it were brings before us the whole history of the Church of Christ and the history of the human race right up to its last moment, up to Christ's Last Judgment. And wherein there is described that which occurs in the heavenly world above at the Lord's Throne, the Apocalypse constantly speaks of how the saints pray before the Throne of God for the human race, pray for the whole world. Let us direct our attention to that place in the holy book where it is related how there stood before the Lord's Throne an angel of God who had a golden censor, and he was given an abundance of fragrant incense, so that together with the prayers of the saints he might offer this incense on the golden altar which was before the Lord's Throne. And the fragrant smoke of the incense with the prayers of the saints ascended up before God from the hand of the angel. Thus do the saints offer up prayers for us sinners before the Throne of God. Therefore never be downcast in spirit if it seems to you that you are alone; remember that on earth people may abandon you, but we are always under this covering of prayer of our elder brethren, Gods saints, who always pray for us their younger brethren and never cease to pray. And in hope of this covering of their prayer, the Church constantly calls on us to pray to them – sometimes to a single saint, sometimes to all saints. And this choir, immeasurable immense, of those righteous who have pleased God intercedes before God for the human race and for the whole world. And now we all, by God's mercy, are present at a spiritual triumph, when to this assembly of God's saints, our intercessors and protector, yet another glorious name is joined – our holy and God-bearing Father Herman, Wonderworker of Alaska, ascetic of the far North. Our Church celebrates his glorification. It must be realized that by this glorification the Church does not make him who has pleased God a saint. He is glorified by God, he is a saint in God, he is attested of God as righteous, for his holy and devout life, attested by the gifts of God's grace, attested by righteousness and sanctity. And the Church does not make him a saint by her glorification, but only humbly and at the same time joyfully points out to her spiritual children the new intercessor, to whom they may now appeal, begging his protection and his aid in all circumstances when this is needful. 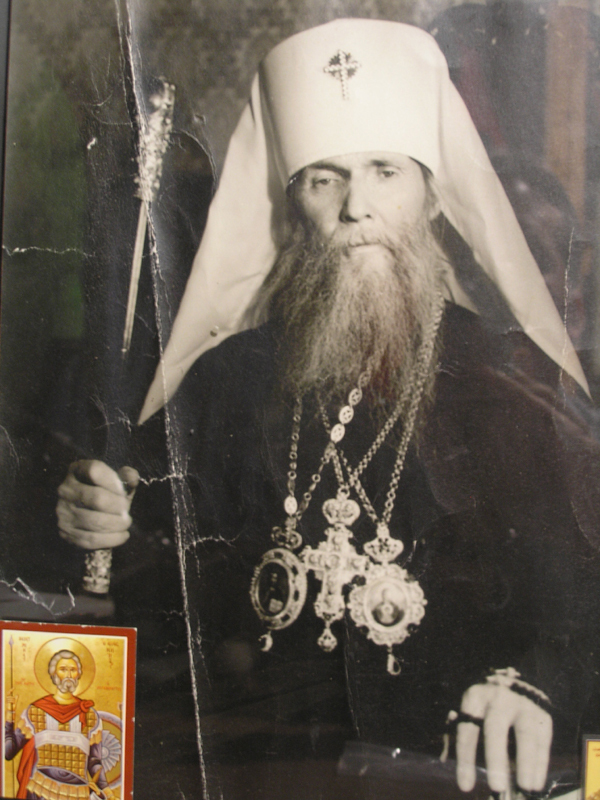 Not so long ago, only six years past, the Church Outside of Russia, Russia Abroad, and likewise captive suffering Russia, celebrated the glorification of the great universal lamp, Father John of Kronstadt; this is the one saint who has already been glorified among us abroad in these evil years. And now next to him there is placed another great God-pleasing saint, likewise an intercessor who prays for us in these grievous times, our holy Father Herman. Both by birth and upbgringing, in his life and in his death, he belongs entirely to the Russian people and to the Russian Church. He is a Russian saint. He is flesh and blood and spirit of the spirit of his native people, his native land. And now it is he whom the Church triumphantly glorifies. Rejoice, O Russia in captivity, suffering Russia! You now have a new intercessor, a new protector. And you, Russia Abroad, likewise rejoice and be glad, dispersed over the vast stretches outside of Russia, one might say, over the whole terrestrial globe! You, too, now have an intercessor and protector. His prayer, even here, while he was still alive, worked miracles. All the more now, standing before the dreadful Throne of the Lord of Glory, our holy Father Herman is powerful to obtain for us all that is needful to us from God's goodness both for temporal and for eternal life. Let only our own faith not grow weak. Let us only never doubt that this prayerful protection and intercession is truly a gift of God's mercy to us. Let us then keep festival, let us rejoice in the goodness of the Lord, Who is wondrous in His saints. It is by His grace, His power, that our God-pleasing saints have been glorified – both the saints of old and those more recent, both Father John of Kronstadt and Father Herman of Alaska. They loved God to such an extent that for them to live meant to serve God; they were entirely in God. Was it not out of love for God that St. Herman left his homeland? Out of obedience, as a true monk and ascetic, he went far away, not forgetting his homeland and its holy places, and gave himself there completely over to the service of God and his neighbor, and the Lord glorified His faithful slave and laborer by grace and miracles. "Glory be to God for everything!" St. John Chrysostom once said in antiquity. And so now we all, receiving these gifts of God's goodness, should say with our whole soul: "Glory be to God for everything!" Amen.